Ok, I know, thats not fast for me (hey, I was still in the top 10%! ), but this was my last ‘training run’ before my 50 mile ultra in 13 days. I desperately tried to start out slow, I did I did. It seemed the first 10 miles I was saying to myself ’slow down, slow down’ and I would back down. After 21 miles, I decided to treat this like a training run, so I picked up the pace for the last 5 miles, running them about 7:15 pace. Passing people was kindof fun actually. Here, 5 hours after my finish, I feel pretty darn good. One blister on the side of one toe, and a blister over where my ankle brace touches the top of my foot. My lovely wife and daughter were my ‘crew’ giving me encouragement, hugs and some ‘different’ marathon food. I wanted to test a few ‘new’ things for my ultra. This time I tried potato chips to go along with my peanut butter sandwich and ‘flat’ coke. Yummy yummy. I also took along my cell phone to communicate with Val and SJ, but also to call my parents around mile 10. I tried using my cell phone’s ‘hands-free’ microphone/earplug combo but it didn’t work out so hot, so I had to resort to using it the old fashioned way, holding it up to my ear. That worked OK, since I was still sort of jogging. 1. Go out slow, force yourself. Tell yourself ‘If I still feel this great at mile 30, then I can pick it up’. I will have my heart rate monitor with me (I forgot it this time) so that will help. 2. Eat more. After my PB sandwich at mile 13 I didn’t get hungry again, but I should have eaten some more. I had plenty of water and gatorade, drinking some at every other station it seemed. 3. As soon as it feels like a blister, stop and correct it. I pushed on today because I knew I could survive until the finish. If I get another one in mile 20 in Chicago, I WILL stop. 4. Sunglasses! I forgot mine and had to steal my wifes at mile 8.5, the first time I saw her. A very nice day for a run, a bit on the cool side. I started out the race in the lead for the first half mile. My 1 mile split was 6:01, 2nd mile split 11:59. That's what we call a ‘negative split’ which doesn't happen for me too often. Again, since marathon day is fast approaching, I couldn't take a day off from training, so this was my tempo run for the week. Unlike my last race, I did my long run (18 miles) for the week on Wednesday so as to have three days rest. I was hoping for a sub-19 time, and got it. The day was absolutely perfect for a run. About 50 degrees, no wind, and blue sky. I started out solid (first mile at 5:50) but then slowed down. I could feel the 15 miles I put on two days ago as the race went on. 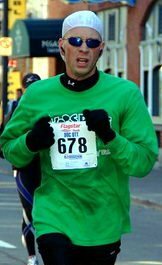 As my first marathon is mere weeks away, I cannot ‘give up’ any training days for races, so I did my long run of the week on thursday, and the race was my ‘tempo’ run of the week. I will do the same for the next two races for the same reason. Those are both 5Ks. foods, party a little less, lose some weight, etc. I was making improvements, but they were small. 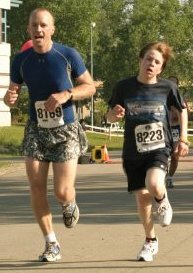 Then I decided to start training for a marathon, and actually ran in a half marathon. Last Saturday was a turning point. With great success in that race I realized that I actually have a shot to qualify for Boston, almost every distance runners dream. With that as a legitimate goal, my focus has sharpened even more. My motivation for eating better, having a better lifestyle, being more kind to people (keeps stress low) seems to have increased 3 fold because of that race. I feel absolutely fantastic, and am getting better everyday. Ahh, life is good. Remember, there is no finish line. The weather was horrible. About 30 degrees, 10-15 MPH winds and raining fairly hard. It was just plain awful For a few days before my body was just dragging. That on top of a 2pm start , I am surprised I did as well as I did. The afternoon start was tough because it was hard getting food into me beforehand. How much toast? What time? That and all morning I was thinking about the race and started psyching myself out. Not my favorite race, for sure.